Starting a blog can be exciting. You’re brimming with all these fantastic ideas for posts, you are publishing regularly and then you look down out your visitor counter and realize that nobody is reading your work. It seems like all those hours you’ve spent writing your posts and designing your site has gone to waste. After all what’s the point of publishing to the world if the world isn’t interested in what you’ve got to say? Before you give up on blogging, there are some things you can do to increase your readership. The first is called Search Engine Optimisation (SEO). 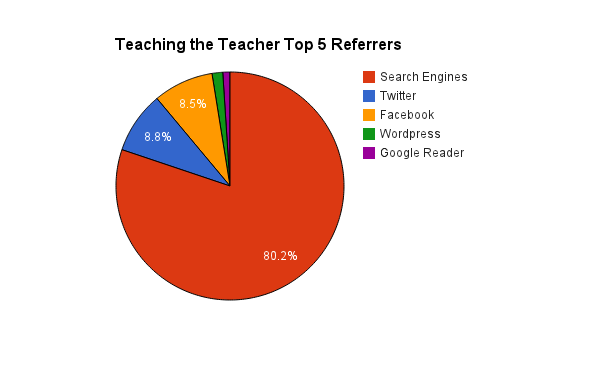 Most of my traffic comes from search engines directing people to my blog. If you want to know about say requirements for being a Professional Teacher in New Zealand I’m the top result after New Zealand Teachers Council (which is both terrifying and awesome at the same time). Teachers going by first name there I am again popping up in the first few hits. There’s an entire industry that’s built up around SEO marketing and consulting that sell products which they say will get you to the top of the search engine. 90% of it is utter rubbish. Google’s algorithms are smart, and they reward sites that consistently produce original content. There are a couple of other small things you can do to increase your blogs attractiveness to search engine. But really attracting visitors from search engines is simple. Produce original content people can’t find elsewhere. I know how you feel but keep going because as much as we would like people to read our blogs ( thanks for the tips) I know that if you are like me, the thought processes involved in the creation of the posts are really valuable and reflective. I agree I wouldn’t blog if I didn’t enjoy the process of writing but I’d be lying if I said I didn’t want people reading it. Thanks for the helpful nuggets of info Steph – particularly giving any images you post descriptions! Very timely.